What a devastating blow. I just found out. 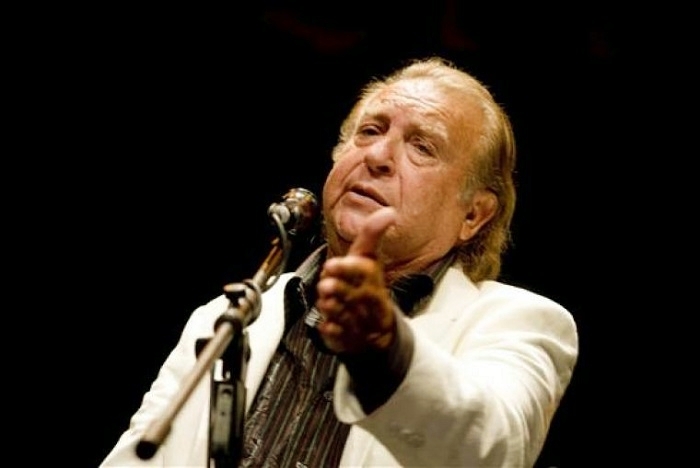 Juan “El Lebrijano” Peña died this morning at his home in Seville at the age of 75. I did not see it coming. I knew he had taken ill but never thought his journey to eternity to fill the throne he deserves on the Mount Olympus of the Gods of Art, next to Don Antonio Mairena, Manolo Caracol, and a select small group of geniuses of song, dance and guitar, would occur so soon. Sometimes, even from the divinity of the chosen ones, things happen too quickly. Heaven must be going through a serious crisis. We have always been told that supreme happiness is gained through the contemplation of God. But God, the pinnacle of wisdom, must have thought that having good people eternally contemplating him could become very boring. And so he turned to the most important of all his inventions: music, that breath of divinity which – in the allocation of science and the arts that God the Father carried out upon the creation of heaven and earth – was bestowed on Roma. Also divinely given to Roma was the Cherubim Choir – heavenly angels singing beautiful melodies and playing violins and guitars in time. In time with heaven, of course, which should not be very different from what Juan “El Lebrijano” Peña was doing when he sang in soleá or bulería rhythms. But we suspect that the Cherubim Choir must have deteriorated, or that someone had gone to Our Lady of Sorrows to negotiate with her son, Jesus of Health – the Rom – so that he would find the best artist, the most complete one, the most brilliant performer, the most visceral one, whose guts churn when he sings (even though angels do not have guts, they get the message) and shake up the Cherubim choir members who had been a bit behind the times since they had been born 5,100,000,000 years ago. And yesterday in the early morning hours, God called Juan “El Lebrijano” Peña, who had recorded a record entitled “the word of God to a Rom” – in order to give singing lessons to those whom the crisis had jeopardised their universally recognised reputation of “singing like the angels”. So much for my tribute – supposedly but unsuccessfully poetic – to the person who has shone the brightest as the best ambassador and the best performer of the “disembodied reason” that gives bodily existence and life to what Mairena’s teacher called “Romani-Andalusian art”. Allow me to stop here today. My hands are shaking over the computer keyboard. And now I am unable to express in just a few words what Juan has meant to me personally. We have shared hours and hours of friendly conversation about our people and our contribution to flamenco! Many have been the times that I have presented on the stages of Barcelona the warmth of my “Crónica Flamenca”, a daily programme that I hosted on Radio Nacional de España for more than ten years! How much have I cried while listening to his record “Persecución”, that insurmountable monument to the inner being of the Romani people! And how many times did we laugh and have fun on that trip we made together to India to meet with Roma from around the world and share our hopes for the future with Prime Minister Indira Gandhi. Latchó drom, Juan, phral. Ash devlesa. (“Bon voyage, Juan, my brother. Go with God”).